Up to 600 and 1200 lines per minute! Monthly workloads up to 345,000 pages per month. Rugged and reliable with the lowest cost of operation. Straight paper path for jam-free operation. Auto-Gap automatically sets the correct print gap based on form thickness. Outstanding print quality with clean-hands ribbon cartridge. SmartRibbon technology ensures the same print quality on the first form and the last form. Automatic form profiling on forms with varying thicknesses, allowing optimum print quality on all portions of the form. Ribbon Monitor provides ribbon status to insure print quality and improve efficiency. User installable Ethernet, Twinax/Coax, and IPDS for Ethernet or Twinax/Coax. The 6306 and 6312 line printers are the first and only line printers to offer Auto-Gap which simplifies operator set-up and printer use by setting the optimum print gap based on the form thickness. For forms with varying thicknesses, the auto-gap feature detects ands sets a variable print gap to produce the optimum print quality on all portions of form, from label to tip-on cards, and more. The patented SmartRibbon is available on the 6312 and ensures a uniformly high contrast over the ribbon’s life – the last form looks as good as the first. 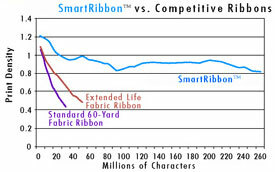 This long-life ribbon cartridge significantly reduces user intervention and increases productivity. Note: Exceeding the monthly duty cycle will not void the warranty if TallyGenicom consumables and maintenance kits are used. Easy-load, Smart Ribbon® clean-hands cartridges at 60 and 250 million characters – ribbon fault detection . Straight paper path, four tractor system, paper out and paper motion detection, forms position retained in non-volatile memory. D: 22.25"x31"x36" W: 140 lbs. D: 22.5"x36.5"x49" W: 214 lbs.